An airline pilot has reported a near miss in which a “rugby ball”-shaped UFO passed within a few feet of his passenger jet while flying near Heathrow Airport. The captain told the aviation authorities who have investigated the incident that he was certain the object was going to crash into his aircraft and ducked as it headed towards him. The investigation has been unable to establish any earthly identity for the mysterious craft, which left the aircrew with no time to take evasive action. The incident occurred while the A320 Airbus was cruising at 34,000ft, around 20 miles west of the airport, over the Berkshire countryside. The captain spotted the object travelling towards the jet out of a left hand side, cockpit window, apparently heading directly for it. He told investigators he believes the object passes “within a few feet” above the jet. He described it as being “cigar/rugby ball like” in shape, bright silver and apparently “metallic” in construction. Once he had composed himself, he checked the aircraft’s instruments and contacted air traffic controllers to report the incident. However, there was no sign of the mystery craft. The incident was investigated by the UK Airprox Board, which studies “near misses” involving aircraft in British airspace. It checked data recordings to establish what other aircraft were in the area at the time, but eliminated them all from its quest to find out what had been responsible. It also ruled out meteorological balloons, after checking none were released in the vicinity. Toy balloons were also discounted, as they are not large enough to reach such heights. Military radar operators were also contacted but were unable to trace the reported object. The sighting occurred in daylight, at around. 6.35pm on July 13. It has only emerged now, following publication of the report, which concluded it was “not possible to trace the object or determine the likely cause of the sighting”. The report does not name the airline or flight involved. Even though it describes the aircraft as being “just to the west of Heathrow”, aviation experts believe that at such an altitude it would be unlikely to have taken off from, or be preparing to land at, the west London airport. Instead, the A320, which is popular with many carriers, among them British Airways and Virgin, is likely to have been travelling between a regional airport elsewhere in the UK, and another on the Continent. The aircraft typically carry about 150 passengers. The Ministry of Defence closed its UFO desk in December 2009, along with its hotline for reporting such sightings. Following that change, the Civil Aviation Authority took the decision that it would continue to look into such reports, from aircrew and air traffic controllers, because they could have implications for “flight safety”. Flights were re-routed or forced to circle an airport for over an hour after Chinese air traffic controllers saw what they believed to be a UFO hovering over the runway. The incident, which took place at about 8 p.m. on Sept. 11 at an airport in Baotou, is the eighth reported UFO sighting in China since June, according to AOL News. Back-to-back sightings in June alarmed Chinese residents. The alert was triggered by bright lights in the sky that moved erratically, but reports claim that air traffic controllers at the Hohhot Air Traffic Management Bureau spotted the object on their radar. After about an hour, the object and the lights suddenly vanished and passenger jets were allowed to land. While the others were dismissed as part of routine military exercises, the Chinese government has refused to comment on this sighting. 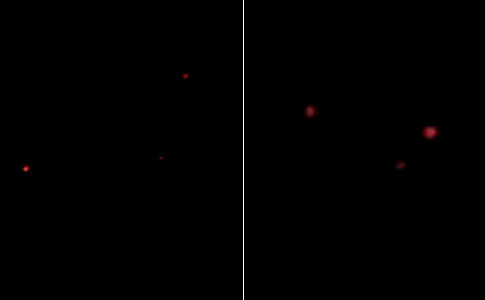 A Youtube video posted this week by residents of Lafayette, Colorado shows three seemingly unconnected red lights floating in the night sky on March 20, 2011. During the video, voices can be heard trying to figure out what the lights could be. “That is the creepiest thing ever,” one man can be heard saying. “I wonder whether there will be anything in the news about this tomorrow,” another says. 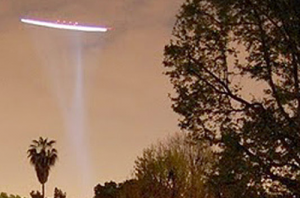 The lights were also captured on video by others in the Lafayette area. Instead of aliens, maybe it is just road flares tied to balloons. Someone did just that in 2010 in Southern California. Shown below on the left is the scene from Colorado last week, and on the right is shown the road flares from last year in California.